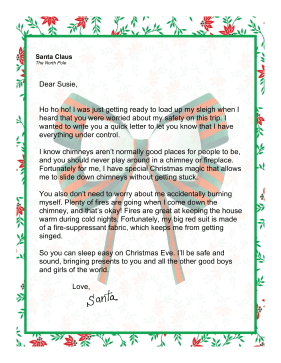 This letter from Santa addresses concerns about safety coming down the chimney. Ho ho ho! I was just getting ready to load up my sleigh when I heard that you were worried about my safety on this trip. I wanted to write you a quick letter to let you know that I have everything under control. I know chimneys aren't normally good places for people to be, and you should never play around in a chimney or fireplace. Fortunately for me, I have special Christmas magic that allows me to slide down chimneys without getting stuck. You also don't need to worry about me accidentally burning myself. Plenty of fires are going when I come down the chimney, and that's okay! Fires are great at keeping the house warm during cold nights. Fortunately, my big red suit is made of a fire-suppressant fabric, which keeps me from getting singed. So you can sleep easy on Christmas Eve. I'll be safe and sound, bringing presents to you and all the other good boys and girls of the world.